I’m enrolled in a program to get my secondary mathematics certification (Those who can, do, those who can’t, teach…yeah I know I’ve heard it all before). It has taken away time from building guitars as the homework is oppressive and the reading is double secret oppressive. I’m progressing on guitar 1001, but in niggles and bits. 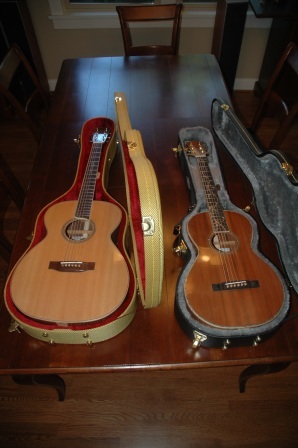 John, customer of guitar 905 has sent me a few “baby pictures”. Pictures with babies and guitars, that is. 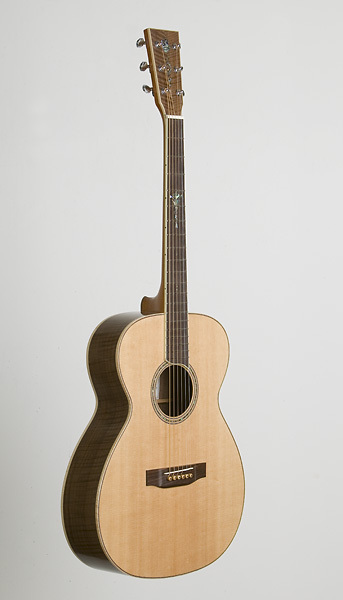 The guitar was dedicated to his daughter Annabelle, and here she is. Yeah, babies are cute. 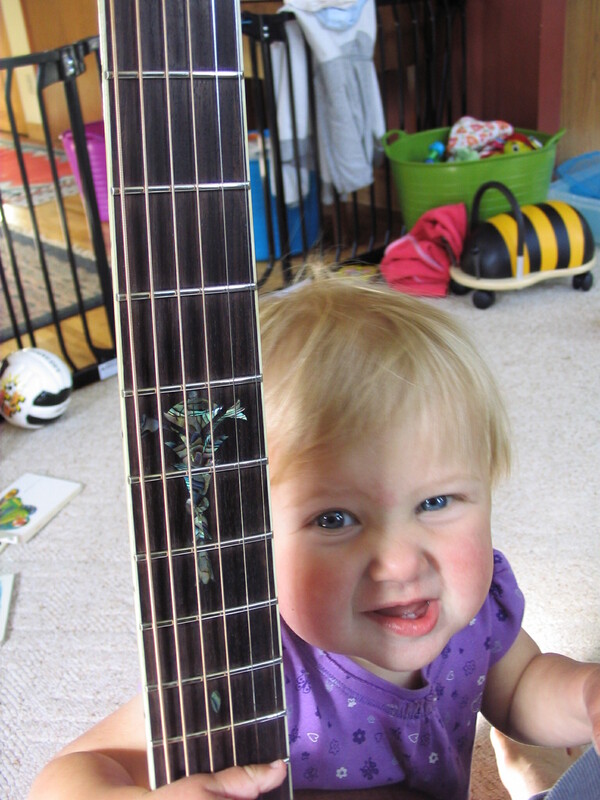 Get ’em started early, and they’ll be awesome guitarists. 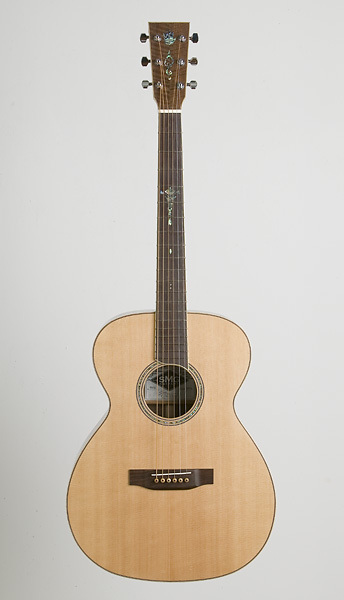 Guitar 905 photo gallery. 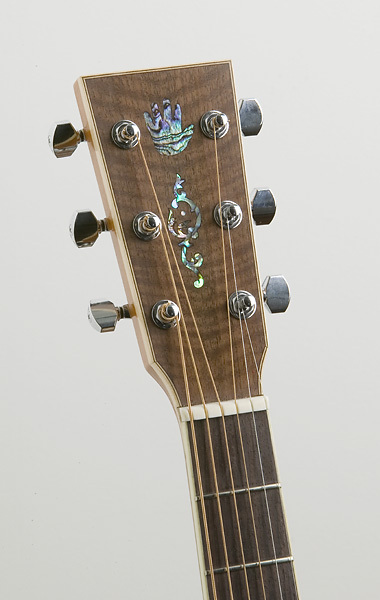 Headstock design came from client. 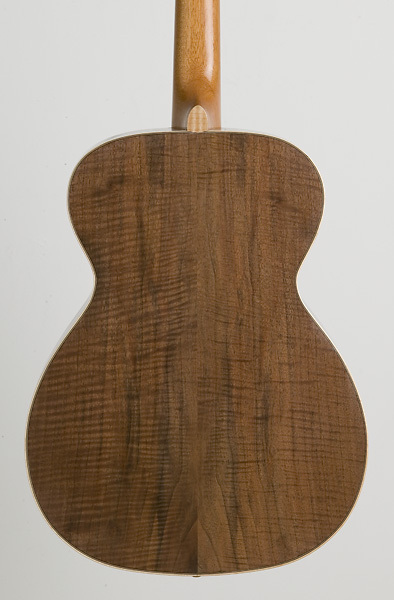 Both the nut and saddle have been shaped in preparation for stringing up. 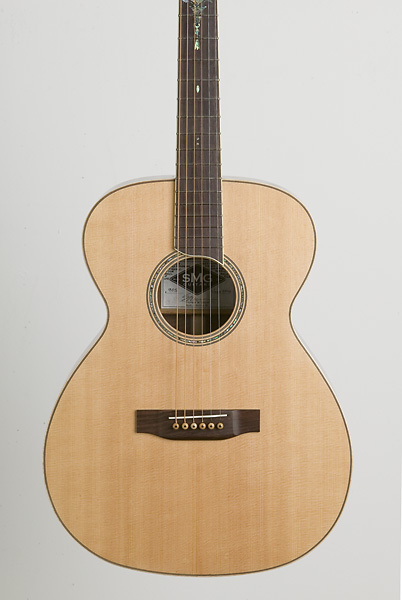 I need to slot the bridge pin holes for the string entrance and notch the nut for the strings. 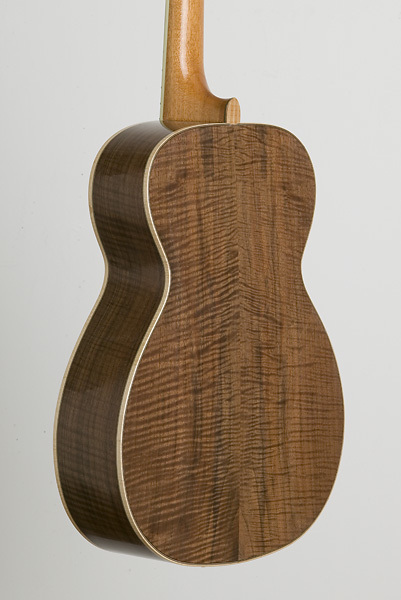 Per the customer’s request, this is a very narrow neck at the nut. I’m excited to see how this narrow neck feels/plays. 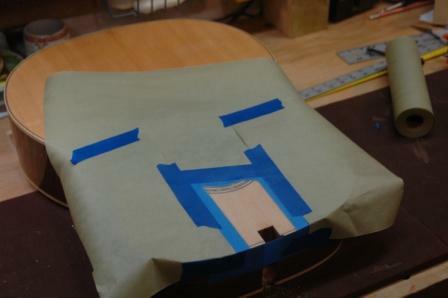 I masked off the guitar body to avoid getting fret shavings on the finish or in the soundhole. 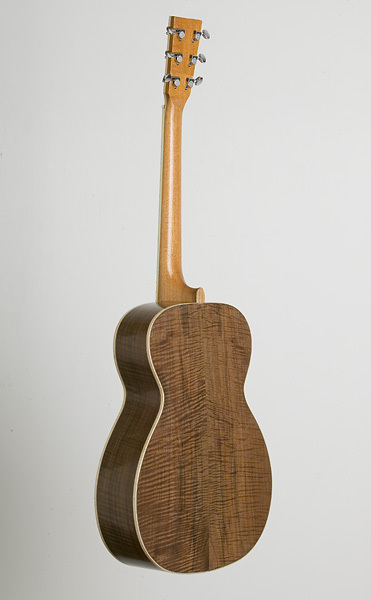 The first opportunity is to use a file to level the frets with each other. 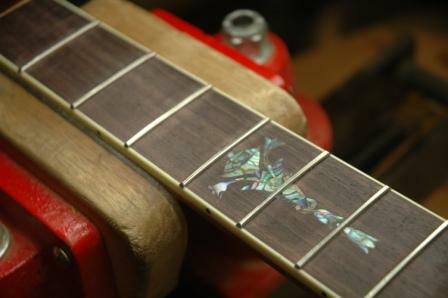 Fret 5 and 14 were the highest, so I filed to and between them until I started to see filing marks on the frets in between. Next I drew the file across all 20 frets attempting to create one continuous flat surface across all frets. 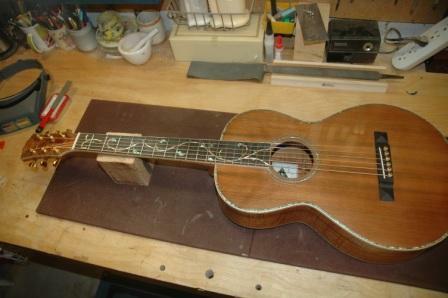 Once I was close, I bevelled the ends of the frets to a 45 degree angle and removed most of the overhang for each fret. I went back and dressed more until the frets were essentially flat. I still had a wee bit of clearance between the straightedge and frets 1 and 2. 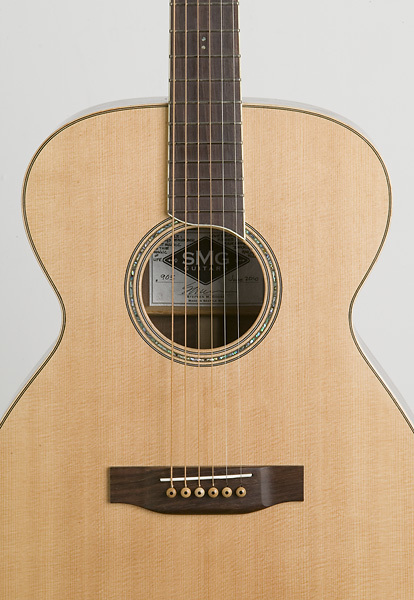 A quick truss rod adjustment brought those into a tolerable distance. 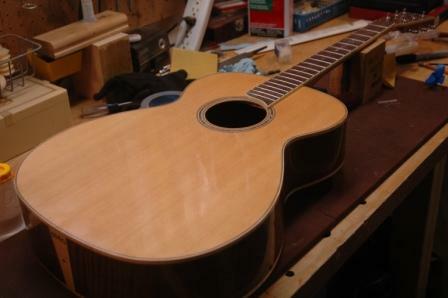 I’ll dry install the nut, saddle and strings before crowning and polishing the frets. 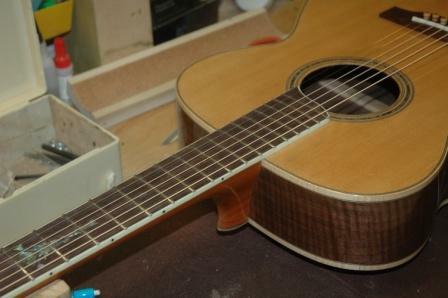 This will allow me to set the correct string height and check for any fretting problems which need further filing. 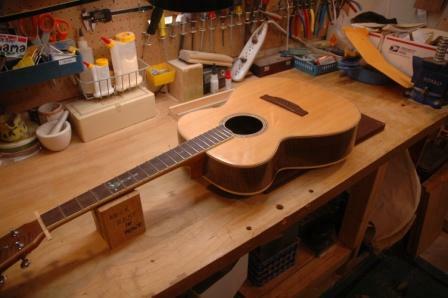 Once (and it’s usually two or three) I have the proper setup, I can go back and crown, dress and polish the frets and install the nut and strings permanently (don’t forget to install the label after blowing out all the crap in the box Stephen!). 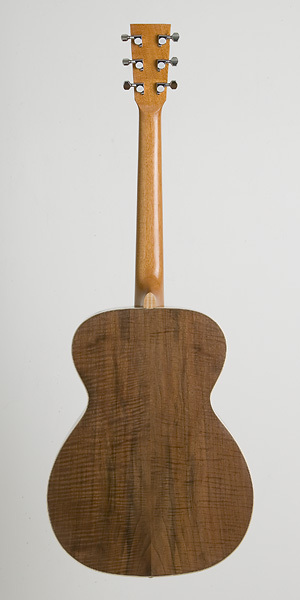 Install the strap peg on the heel, give it one last polish on the buffer, and this guitar will be done! I’ve ordered a 3 degree reamer to properly set the bridge pins. 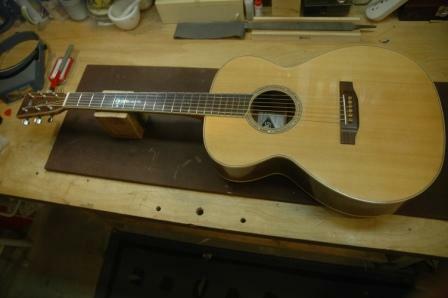 While waiting, I have shaped the nut and saddle and will dress (level) the frets, then install strings to do final setup adjustments. Well, the final steps are looming. 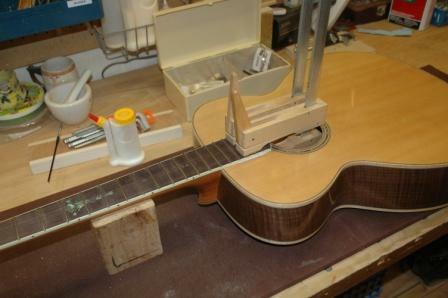 The neck is installed, the bridge is installed and the next step is to shape the saddle and nut and level the frets. Taped off the area where the lacquer needed removing for neck gluing. I use a lacquer stripper then scrape away with a razor blade. 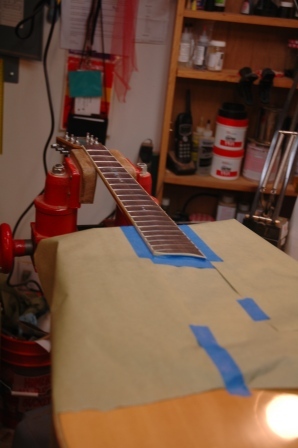 This surface needs to be brought back down to raw wood for gluing the fretboard to the soundboard. 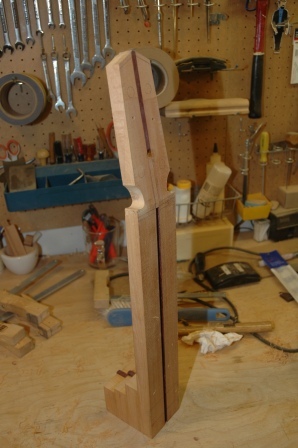 Once the surface is prepared, glue is applied, then the neck is bolted on and clamped. 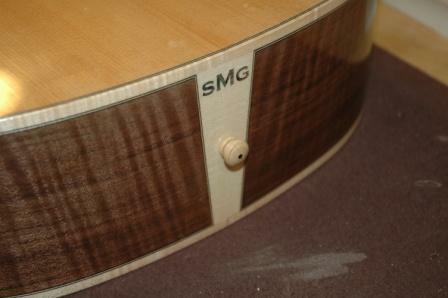 Next, position the bridge and similarly remove the lacquer to allow gluing. 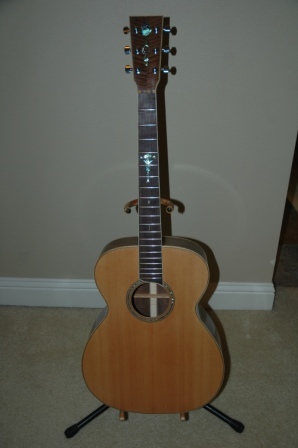 Frets are installed and trimmed, tuning machines installed, and neck and body are buffed and polished. 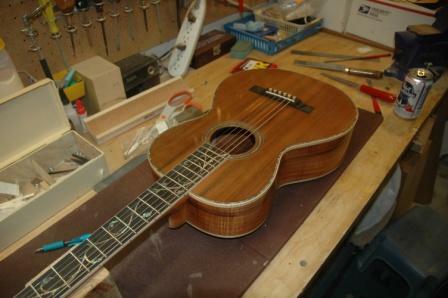 Next step, fine adjust mortise and tenon, remove lacquer on body where fretboard meets, then glue/bolt on the neck.